It's a man! It's an ant! It's a Mant! When I went to the Jeonju International Film Festival in this April, I was reminded again that the old theaters at the downtown of my hometown are gone. Most of them are now replaced by a bunch of multiplexes, and I can't say the old theaters were better than their replacements. While there were the big theaters where I could enjoy movies like "Independence Day" or "Starship Troopers," I remember too well how shabby several theaters were in early 1990s, compared to the current standard; I am happy with the comfortable seats, nice bathrooms, and agreeable viewing condition in multiplex theaters. None the less, the old theaters have a place in my memory. Thanks to my frugal mother, I and my little brother learned that it was much cheaper to bring snacks rather than buy them at the theaters, but some snacks like dried squid were irresistible to us. When I watched "Face/Off" (1997) with my father, I learned that the movies rated '18' were not always forbidden to teenagers like me. I laughed frequently while watching "Bean," and then, when the end credit rolled, I was embarrassed to find the neighbor family near my seat. 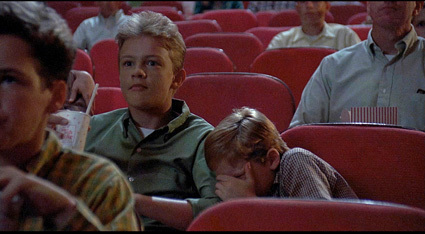 So far, my brother has never ridiculed me for being asleep during the showing of "Entrapment" (1999), in spite of Catherine Zeta-Jones. 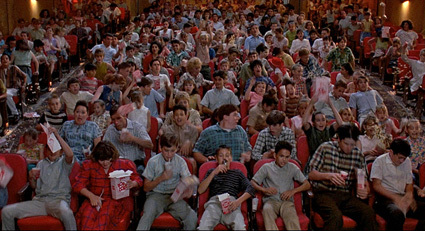 In the case of young characters in Joe Dante's cheery comedy "Matinee" (1993), they get experiences to be cherished for the rest of their lives at their local theater while earth is facing the possibility of the end of the civilization. It is November 1962, and Cuban Missile Crisis has officially begun with a special announcement from President Kennedy on TV. Their town, Key West, Florida, is close to Cuba, and the tension is palpable to the townspeople. The comedy comes from how silly and hysterical people were at that time when the world seemed quite close to the end. In the case of Gene (Simon Fenton), one of the boys we meet at the beginning, his father is a navy officer on board in one of the ships in the blockade. 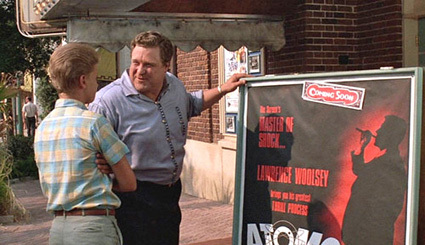 To exploitation filmmaker Lawrence Woolsey (John Goodman), this situation is too perfect to miss for the promotion of his latest horror movie which, like many monster B-movies of the time, exploits fear about atomic bombs and World War III. After arriving at the town with his girlfriend and leading actress (Cathy Moriarty), he does everything he can do to draw the people to the premiere showing on Saturday, including sparking fake controversy to draw their attentions. (Here is a lesson for some people: protesting against a movie gives it free publicity). Woolsey's visit to town is fantastic news to Gene. As we've seen in the bedroom he shares with his little brother, he loves monster movies -- especially the ones made by Woolsey. 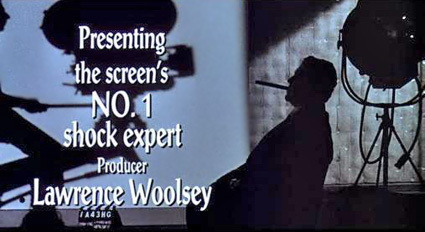 Gene approaches him when Woolsey persuades people to watch his movie in front of the theater. They soon become close, and Woolsey generously shows his young fan how his plan will work. In a nice small scene featuring a simple animation based on their mutual imagination, Woolsey sincerely explains to Gene about his job. He makes cheap movies, but he knows what good horror movies are -- the ones that scare the audiences a lot while entertaining them, and then relieve them when the lights are turned on. 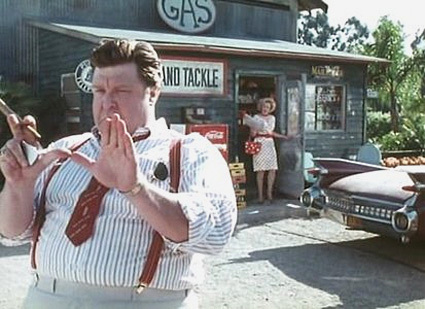 With his pleasant performance, John Goodman presents us an avuncular dreamer with ever-present optimism and jolliness. He is a movie businessman belonging to the lower strata of Hollywood, but he tries to sell his films with imagination and passion. Plus, he's a good salesman with skillful showmanship; he will eventually talk you into watching his movies even if you know his movies are more or less than average B-movies. As widely known, Goodman's character is mainly based on the legendary B-movie producer/director William Castle. Like his fictional counterpart in the film, Castle did try to promote his films by any means necessary. 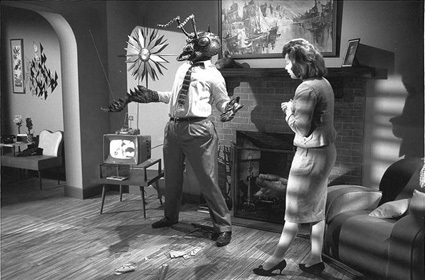 For instance, a glowing skeleton was floated over the audiences in case of "House on Hunted Hill" (1959), and the seats were equipped with the buzzers to induce the audiences to scream in case of "The Tingler" (1959). When "Macabre" (1958) was shown at the theaters, a life insurance policy was given to the audiences in case they died of fright during the film; he even had nurses stationed at the lobby and a hearse parked outside the theater. When I talked briefly about Castle to an undergraduate student a few days ago, he asked me, with disbelief, whether he really did such things like those. I do not think his tactics, as gimmicky as 3-D, enhanced his movies much. (I personally think the best thing he did in his career was letting Roman Polanski direct "Rosemary’s Baby" (1968) instead of directing it for himself.) But he certainly gave something to be remembered with a smile, and that is endearingly reflected in Dante's film. Before the premiere showing, Woolsey's girlfriend, wearing nurse uniform, demands audiences to sign the medical consent form in case they die while watching the movie. Electronic buzzers are wired to the seats for giving a jolt to the audiences. Smoke is fumed from time to time in front of the screen. The theater is trembled thanks to "Rumble-Rama." And a guy hired by Woolsey wearing a big rubber suit (guess what it looks like?) stalks the aisles to scare the audiences. While it's hilarious to watch the audience reacting to these outrageous tactics, there is more fun during the premiere sequence while things get complicated inside the theater. Gene's friend Stan (Omri Katz) recently began the relationship with a schoolgirl he likes, but he is threatened by her ex-boyfriend, who has just gotten out of reform school. Stan lies to her that he doesn't have time to meet her on Saturday, but, unfortunately, when he goes to the theater with his friends, he soon comes across her. Furthermore, a guy hired by Woolsey is none other than her ex-boyfriend; you can see a big trouble coming to Stan. 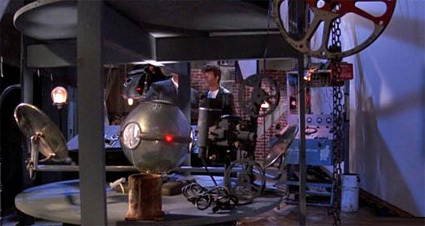 Woolsey's movie, "Mant," adds extra hilarity to this uproarious situation. 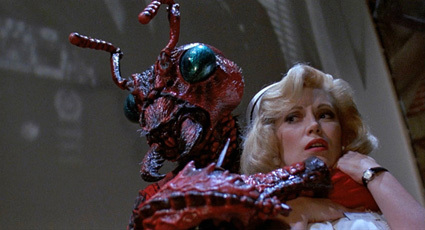 Like many awful B-horror movies from that era, it is fun to watch it due to its serious attitude to a ridiculous story ("Young lady, human-insect mutation is far from an exact science."). People in these movies are horrified at the sight of huge monsters, and the audiences were probably scared at that time, but they now look as menacing as teletubbies to us. I sometimes watch the trailers for these movies posted on YouTube, and they have never failed to tickle me. As a mix between "The Fly" (1958) and "Them!" (1954), "Mant" is made with lots of care in homage to that era. 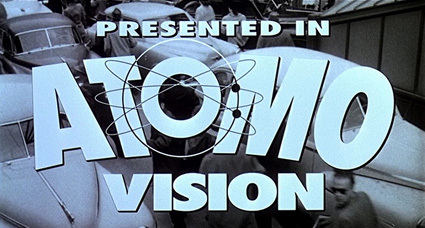 Several music cues from the B-horror movies made during the 1950s including "It Came from Outer Space" (1953) and "Tarantula" (1955) are used for authenticity. 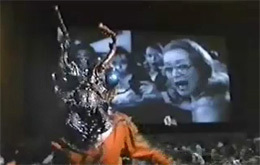 Some of the actors in "Mant" actually appeared in the science-fiction movies during that era, and Cathy Moriarty's character, Ruth Corday, is a tribute to the B horror-movie actress Mara Corday. There are also goofy dialogues to amuse us (my favourite: "What in creation do you call that thing?" - "Bill."). This story must have been close to the heart of director Joe Dante, whose career started with low-budget movies. After working as an editor for Roger Corman, he debuted as a director with "Pirahna" (1978), a goofy horror movie which was a cheerful parody of "Jaws" (1975) (it was followed by a horrible sequel which was incidentally the first movie directed by James Cameron, who also worked under Corman). Dante was later recruited by Steven Spielberg to direct "Gremlins" (1984), which is still his biggest commercial success, but his B-grounded sensibility seemed not to get along well with Hollywood. Though he made some enjoyable movies including "Innerspace" (1987), his career descended through several commercial failures including "Gremlins 2: The New Batch" (1990), the wackiest and the most anarchic film made by Amblin Entertainment. 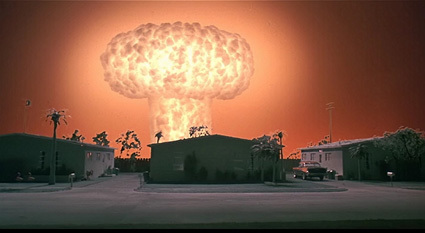 Filled with his affection to B-horror movies and likable characters, "Matinee" is the sunniest work in Dante's career. Like the audiences beholding star celebrity, the young characters in the movie are naturally less flashy than Woolsey, but they're engaging as the part of that world depicted with nostalgia. 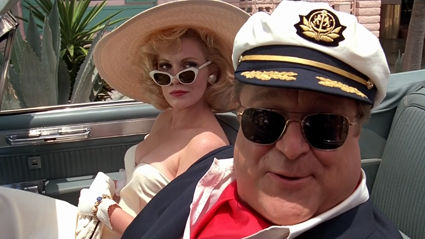 As the girlfriend with weary no-nonsense attitude, Cathy Moriarty nicely complements Goodman's buoyant character. She is usually sarcastic about his business, and she grudgingly does what he tells her to do, but it turns out their relationship is solider than we think at first. She will always remind him of reality while standing by her man. In the end, as we know, the Cuban crisis is over, and the people are relieved to see another day of their lives, and Woolsey moves to his next attraction to come with lots of hope as usual. However, as the last shot of the film implies to us, the most turbulent part of the American history will soon begin - and their world will never be the same as a consequence. 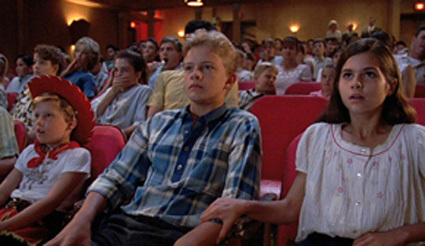 "Matinee" is a charming movie with sweet nostalgia. Though it is about an era very distant to me, it is lovable enough to make me to reminiscence my relatively less innocent experience with the horror movies during my childhood years. Like Gene was fascinated with monster movies, I was drawn to those old VHS tapes in the corners of the rental shops. There were freakish monster movies, disgusting zombie movies, spooky occult movies, and, above all, dead teenager movies. I watched some of them; they were mostly not as good as I imagined from their VHS cover designs, which are, anyway, the loving part of my childhood memory. 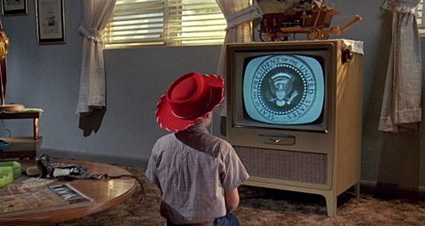 To be frank with you, I was a lot more interested in "Friday the 13th" series movies and memorized the synopses printed on VHS covers, but, boy, how much I was disappointed with them when I finally watched two of them on TV. I was not entertained at all - and I could not understand why some big guy wearing a hockey mask(or bag) tried to kill boys and girls older than me when they seemed to have a good time at the camp. At least, we all can agree that my childhood was more innocent compared to the age of "Saw" (2004) and "Hostel," can't we?